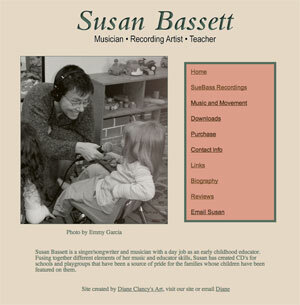 Diane Clancy worked closely with Susan to design this site to highlight Susan's music and her with children and movement. Samples of Susan's music can be heard and reviews are available. Susan Bassett says. "Diane Clancy made my first time working with a web designer a positive, exciting experience. Diane's patience and her expertise helped me to feel listened to and helped to actualize the ideas I wanted on my site." Susan continues, "Diane was open to my comments and feedback and succeeded in designing a web page with the information easily accessible and pleasing to look at. I am very proud of it! I highly recommend Diane Clancy as a skilled, professional designer!" Diane Clancy would welcome talking with you at 413.773.7333.